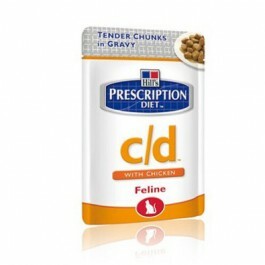 Hill's Prescription Diet c/d - Multicare Feline Tender Chunks in Gravy with Chicken is recommended for initial nutritional management of cats with any type of Feline Lower Urinary Tract Disease (FLUTD), including crystalluria and/or urolithiasis from any cause, urethral plugs and idiopathic cystitis. Nutrition clinically proven to dissolve struvite stones in as little as 14 days. Helps reduce struvite and calcium oxalate stones recurrence. Great taste and appealing texture with tender chunks and delicious gravy. 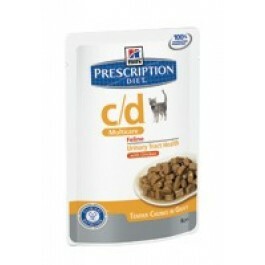 Can be fed exclusively or complement your cat’s c/d™ dry food.